"These are great for entertaining: a meatball with sauce and mozzarella cheese between a little roll." Bake meatballs in the preheated oven for 20 minutes. Pour the spaghetti sauce into a large saucepan; bring to a simmer over low heat. Stir baked meatballs into the simmering sauce. Do not turn oven off. Simmer sauce until meatballs are fully cooked, about 20 minutes. 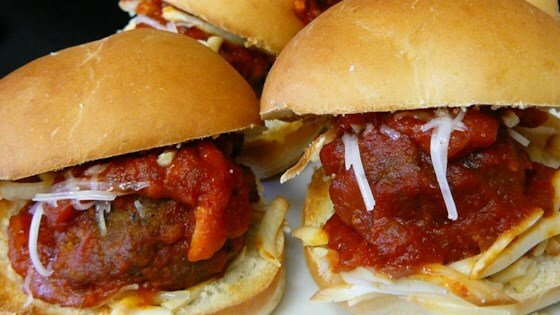 Meatballs become mini sub sandwiches! Amazing! Best meatball subs I have made. Subbed italian bread crumbs for the crackers and did not add salt. Used a slice of provolone instead of shredded cheese. Wow!